Even if you don't qualify for Social Security benefits on your own record, you can still collect a spousal benefit by virtue of being married to someone who qualifies for Social Security on their own behalf. 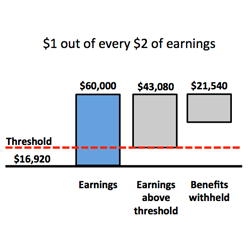 If you have worked and accumulated your own benefit as well, that's where a deeper level of planning might be needed. Our current Social Security program is in a state of transition - If you were older than 62 on January 1st, 2016 you might be eligible to receive a spousal benefit while your own benefit continues to accumulate by 8% per year. (source) We've seen where married couples (combined with financial flexibility) have the most to gain from coordinating their spousal benefits efficiently. We'll help you make sure you and your spouse have all the data on the table to make an informed decision. 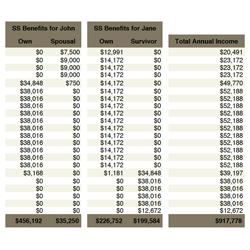 One of the most overlooked aspects of Social Security planning tends to be the importance of the survivor benefit. Our experience has shown us that once you have a clear understanding of how it works, it could cause you to delay your Social Security benefits longer than you might have initially anticipated. This is because once a current (or eligible former) spouse dies, the remaining spouse's income can be significantly less. Knowing how your Social Security decision today affects your loved one down the road is an important step in the Social Security planning process. It's becoming more and more common for people to work past the age of 62. Sometimes this is out of necessity and other times its because the individual enjoys their job or sees the positive health benefits of staying mentally engaged in a line of work they enjoy. Regardless, retiring and starting your Social Security benefits are mutually exclusive events. In other words, you don't have to retire to start Social Security benefits. However, there are significant penalties that can be handed out if you don't understand the rules involved. If you want (or need) to work, we'll make sure to include that in your path to Social Security maximization. Listed below are other Social Security planning topics that we can help you address to make sure you're maximizing your Social Security benefits. *Providence Wealth Management, LLC and Providence Advisors Group, LLC are not affiliated with or endorsed by the Social Security Administration or any government agency. We would be honored to help you and your family make the best decision possible regarding Social Security. To learn more on how we can help you do that, please fill out the following form to get started. Please find below a link for you to download an informational Social Security brochure that we have put together. If you are interested in getting our advice about how to maximize your Social Security benefits in light of your unique situation, we've made the first step really easy. Visit the following link to answer some financial background questions about you and your spouse.